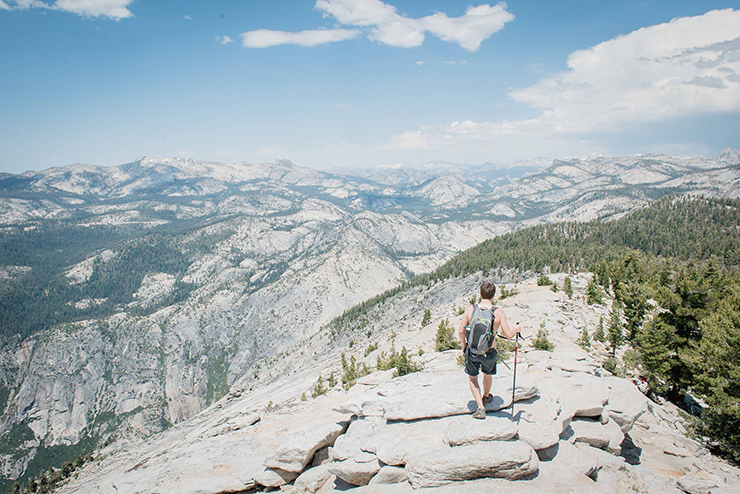 Are you one of the many unlucky ones who couldn’t get a permit to ascent of the most iconic mountain in Yosemite National Park and its surroundings? No reason to mourn! We will convince you of the perfect alternative! We are pleased to offer you: Cloud’s Rest! Higher, more varied and more intimate than the popular Half Dome. Moreover, at the top of Cloud’s Rest you can enjoy the best 360° view of the entire Yosemite National Park. You literally look down on Half Dome. And no, no permit required – unless you want to stay overnight there. There are several ways to reach the top of Cloud’s Rest. 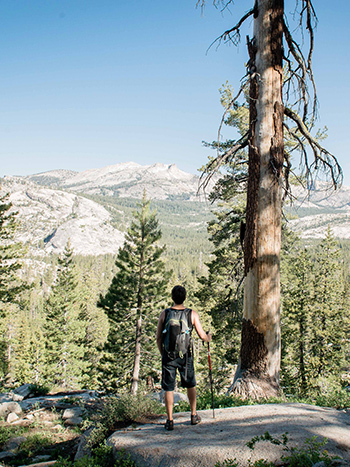 The best trail starts along the beautiful Tioga Road, at the westside of Tenaya Lake. 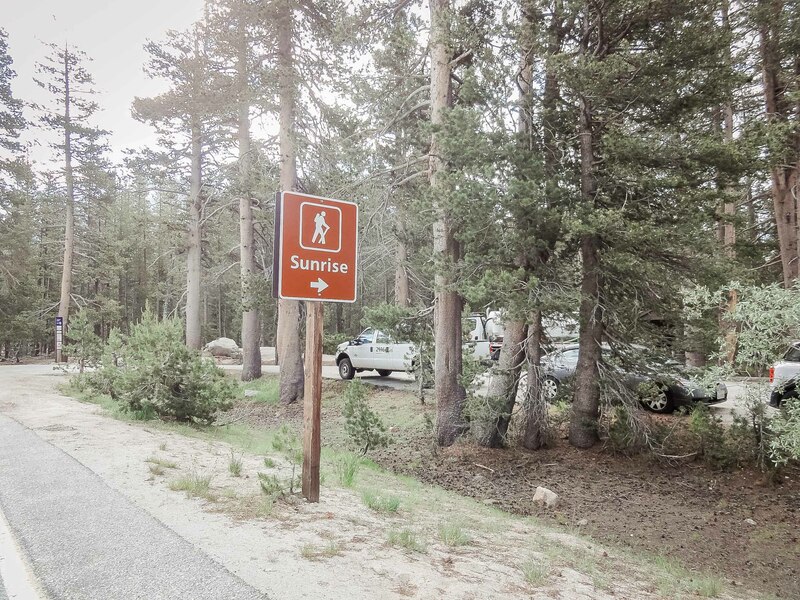 Watch out for the ‘Sunrise’ sign: this is where you should be. There is a shuttle stop but you can also park your car here. Crazy enough, Cloud’s Rest is only indicated from the 2nd direction sign on the path. It is a bit confusing and you may wonder whether you are following the right path, but that is not necessary. 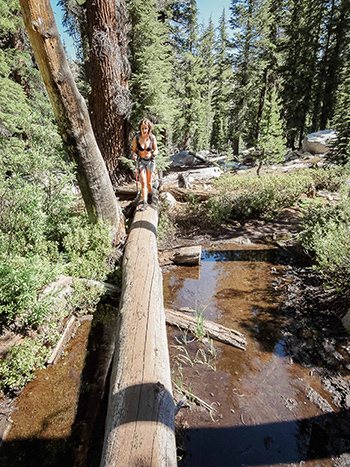 Follow the trail towards “Sunrise Lake” and you’re fine. A very important tip: take mosquito repellent (with DEET) with you, and generously apply it before leaving! The first part of the trail makes you cross a lake where it is swarming with bloodthirsty mosquitoes. Yes, even you, who usually never attract mosquitoes! (Francesca has also been fooled!) Do not be discouraged and move on, once this part of the trail is over, you’ll hardly be bothered again! The path leads you through forests, along lakes, through snow (even in late June! ), among rocks, … A nice mix of different landscapes. Flat and steep sections alternate. It can be quite hard at times but see it positive: this is why you do not have to deal with a crowd here. There are no water supplies along the way, so bring plenty of water. Another possibility is to fill your bottles from the streams along the path. Of course you need to filter the water first. Cloud’s Rest, we call it a destination hike. Not because the trail to the top is not nice, but because the endpoint simply transcends everything. The views build up beautifully during the hike to suddenly explode at the top. Once you reach the summit, you forget all the efforts you made. Left, right, front and rear … It is hard to decide where to look first! An impressive panorama makes you very quiet. And that’s how it is there. Unlike Half Dome, you are away from the crowd and you can enjoy the tranquility and the panorama, overlooking one of the most beautiful places on earth: Yosemite National Park. 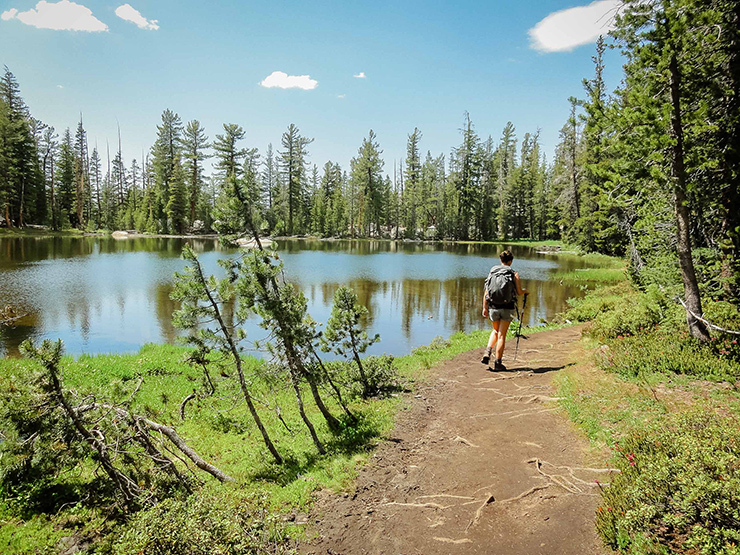 Did you already hiked this stunning trail? Feel free to share your experience below!